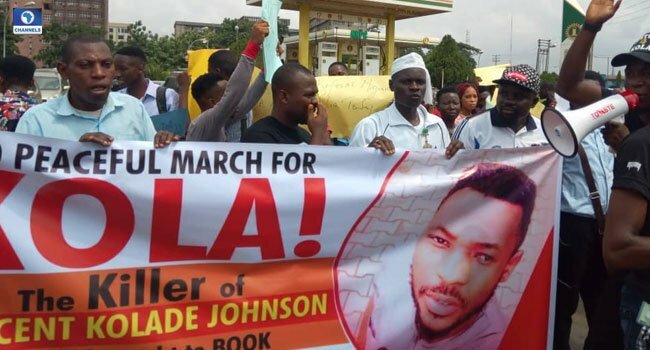 Students and members of the University of Benin Alumni association are protesting over the killing of Kolade Johnson by operatives of the Nigerian police force. Naija News understands that the protesting members took their protest to the state police headquarters in Benin-City, the Edo state capital to express their displeasure. Receiving the protesters on Thursday, the state police PRO, DSP Chidi Nwabuzor, urged them to remain peaceful and wait for justice to take its course. He noted that the police officers who perpetrated the act are already undergoing interrogation. Kolade’s death has stirred a lot of controversies which drew the attention of President Muhammadu Buhari and the Senate President, Bukola Saraki as well as several other government officials and individuals. The Presidency while condoling with the family of the victim expressed sadness and assured Nigerians that the team involved in the killing will undergo the disciplinary procedure. Naija News, however, had earlier reported that Kolade Johnson was reportedly shot by police officers attached to the anti-cultism unit at a football viewing centre.